Product code: W1019cc Categories: Rolex Watches, Watches. This vintage 18ct gold Rolex Datejust model 1601 really is the epitome of a classic watch and has all the look and charm that has allowed it to continue looking great throughout not just the years, but the decades as well. Dating from 1960, this Rolex Datejust is fitted in a solid 18ct yellow gold case that measured the iconic 36mm across plus the Rolex screw down crown. The dial is all original as are those wonderful Rolex leaf style hands that really accentuate the vintage look and continues to give it such a classic timeless style. With the 18ct yellow gold fluted bezel adding that extra elegance, it is fitted on a leather band allowing it to easily be dressed up or down as the situation requires. Inside is wonderful Rolex movement – the 25 jewelled Rolex automatic calibre 1560 fitted with the butterfly rotor. The butterfly rotor is so named as it has partial cut sections, giving it a “butterfly” like look to it. Running perfect and complete with our twelve month warranty, this is a watch that can be worn day or night and always look and feel so good on the wrist. There is nothing quite like a vintage watch, and nothing quite like a vintage Rolex watch on your wrist, and this one certainly ticks so many boxes. Tag: Rolex Datejust model 1601. Vintage 18ct gold Rolex Datejust model 1601. Fitted with the iconic Rolex calibre 1560. 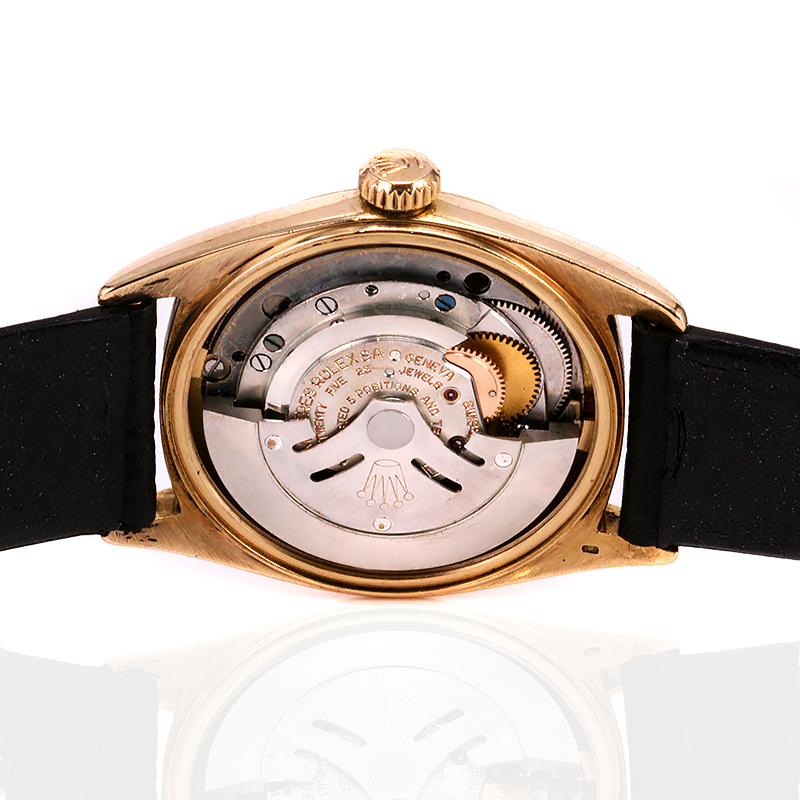 This Rolex calibre has the butterfly rotor which die to its design of having sliced sections on the side, gives it the appearance of a butterfly. This is such a wonderful feature to have inside a vintage Rolex watch, and this vintage Rolex Datejust has the right look and charm to it.